This pendant was made using driftwood and beach stone found along the Lake Ontario shoreline. 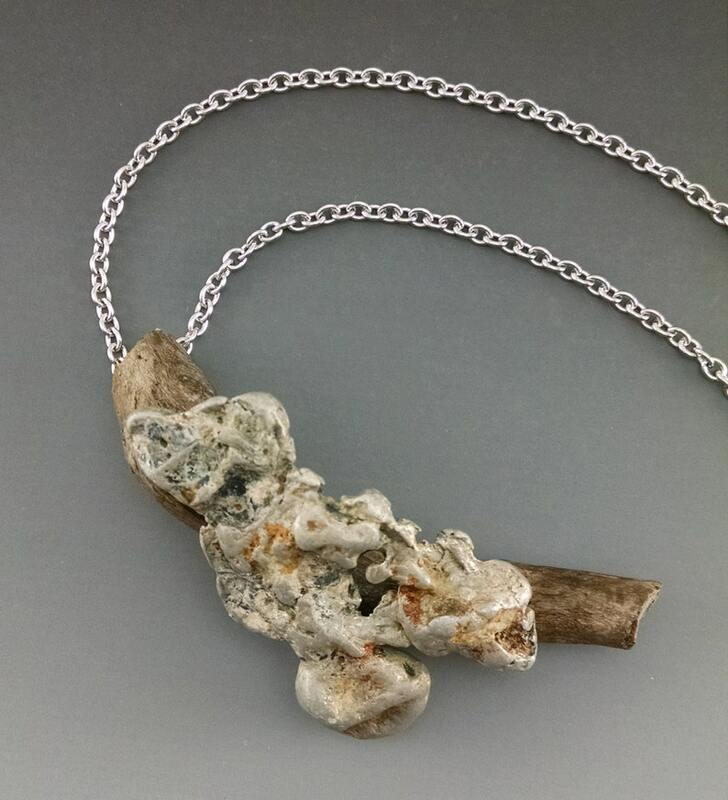 Like you, this beautiful piece of sculptural jewelry is one-of-a-kind. Make a statement! Show your individuality and excellent taste by wearing this small art piece with business, casual or dressier attire. The piece measures: 3" x 1 3/4"
The antiqued silver chain is 20 inches long. All found metal has been finish coated with polyurethane. I love this incredible necklace so much! Its earthy and organic, and feels like my Mother Nature. When I look at it I feel as though it has a story to tell from long ago. Beautiful! Gave as a gift and she LOVED them. Super lightweight. Shipped fast. It arrived in a sturdy package and the jewel itself is contained in a very nice gift box, ideal to make a gift or to store the pendant. Awesome and different. Great seller. PayPal, all Major Credit Cards, and Etsy Gift Cards are accepted through Etsy Direct Checkout. I ship to your ETSY address. Please be sure your shipping address is correct. Orders are shipped within 1 – 3 days of payment receipt. All items are shipped USPS Priority Mail with Delivery Confirmation to all US addresses. You will receive an email through Etsy with your tracking number when your package ships.